In new research, material scientists at Penn State report two discoveries that will provide a simple and effective way to ‘stencil’ two-dimensional (2D), one-atom-thick materials such as graphene in precise locations and overcome a barrier to their use in next-generation electronics. In 2004, the discovery of a way to isolate a single atomic layer of carbon – graphene –opened up a new world of 2D materials with properties not necessarily found in the familiar three-dimensional (3D) world. Among these materials are a large group of elements – transition metals – that fall in the middle of the periodic table. When atoms of certain transition metals, for instance molybdenum, are layered between two layers of atoms from the chalcogenide elements, such as sulfur or selenium, the result is a three-layer sandwich called a transition metal dichalcogenide (TMDs). TMDs have garnered tremendous interest among materials scientists because of their potential for creating new types of electronics, optoelectronics and computation. "What we have focused on in this paper is the ability to make these materials over large areas of a substrate in precisely the places we want them," says Joshua Robinson, associate professor of materials science and engineering at Penn State. "These materials are of interest for a variety of next-generation electronics, not necessarily to replace silicon but to augment current technologies and ultimately to bring new chip functionality to silicon that we never had before." In order to integrate TMDs with silicon in transistors, chip companies will need to have a method to place the atoms precisely where they are needed. That method has not been available until now. In a new paper in 2D Materials, Robinson and his group demonstrate, for the first time, a simple method for making precise patterns of 2D materials using techniques familiar to any nanotechnology lab. "It turns out the process is straight-forward," Robinson explains. "We spin photoresist on the sample in the cleanroom, as if we are going to start making a device. It can be any of a number of polymers that are used in nanofabrication. We then expose it to ultraviolet light in the desired areas, and we develop it like a photograph. Where the polymer was exposed to light, it washes away, and we then clean the surface further with standard plasma-etching processes. The 2D materials will only grow in the areas that have been cleaned." A second simple discovery described in this work could also help advance the field of TMD research, by overcoming the strong effect a substrate has on the 2D materials grown on top of the substrate. In this case, molybdenum disulfide, a highly studied semiconductor TMD, was grown on a sapphire substrate using typical powder-based deposition techniques. This resulted in the properties of the sapphire/molybdenum disulfide interface controlling the desired properties of the molybdenum disulfide, making it unsuitable for device fabrication. "We needed to decouple the effects of the substrate on the 2D layer without transferring the layers off the sapphire," says Robinson, "and so we simply tried dunking the as-grown material into liquid nitrogen and pulling it out into air to 'crack' the interface. It turned out that was enough to separate the molybdenum disulfide from the sapphire and get closer to the intrinsic performance of the molybdenum disulfide." The process is gentle enough to weaken the bonds connecting the 2D material to the substrate without completely setting it free. The exact mechanism for loosening the bonds is still under investigation, because of the complexity of this ‘simple process’, said Robinson. The two materials shrink at different rates, which could cause them to pop apart, but it could also be due to bubbling of the liquid nitrogen as it turns into gas, or even contact with water vapor in the air that forms ice on the sample. "We're still working on understanding the exact mechanism, but we know that it works really well, at least with molybdenum disulfide," Robinson says. 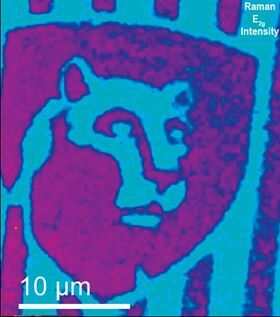 A Raman image of Penn State’s Nittany Lion shows the possibilities of large-area patterning of 2D transition metal dichalcoginides. Image: Eichfeld, Penn State. Synthesis of a new 2D nano material with electrical and magnetic properties. By precisely controlling the size and positioning of quantum dots in a superlattice, scientists are able to finely tune its optical properties.